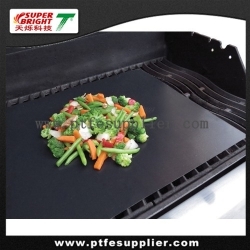 BBQ Grill Liner , made from PTFE and fiberglass fabric, it takes the advantage of the non stick and heat resistance of PTFE with the strength and dimensional stability of fiberglass. Non stick, reusable, heat resistance, easy clean, all this incredible features made our Non stick cuttings type PTFE baking sheet become an indispensable kitchen accessories for food cooking and baking. Any other color, thickness or size can be customized.